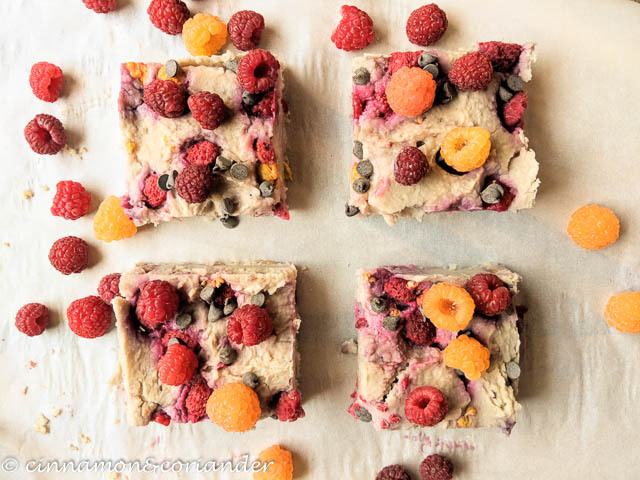 These Vegan Raspberry Blondies are a decadent, yet healthy vegan dessert that tastes just like white chocolate blondies – without the calories and without added sugar! An easy to make, high-protein dessert with only a few ingredients! Try my Vegan Raspberry Blondies for a decadent, yet healthy vegan dessert! Summer is almost over, but our raspberry bushes are still heavy with fruit! We actually had to freeze most of this year’s raspberry harvest as we just could not handle eating them all fresh! Luckily, there are so many great healthy desserts with frozen raspberries to choose from, that I am positive that we will go through our stock pretty quickly. These healthy Vegan Raspberry Blondies are going to be my go-to dessert for the next weeks! These Vegan Raspberry Blondies might be among the best blondie recipes out there! They taste just like White Chocolate Blondies, without all the calories. The main ingredient for these healthy blondies is white beans, making these a high-protein dessert. One Raspberry Blondie has 5 g of protein and only 100 calories! and bake the raspberry blondies for 25 minutes. My Vegan Raspberry Blondies are sugar-free, gluten-free, dairy-free and paleo, making them the perfect healthy dessert for crowds with dietary restrictions! The recipe for Vegan Raspberry Blondies could not be any easier! Preheat the oven to 175 C or 350F. Now, simply blend the beans, sweeteners and vanilla in a high-speed food processor or blender until smooth. Make sure you drained your beans well! 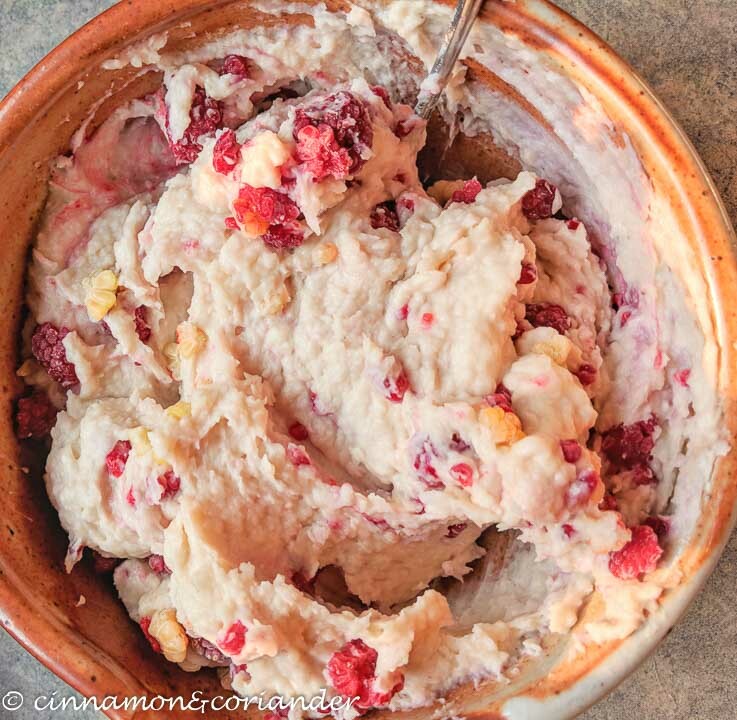 Taste the batter for sweetness, then stir in the baking powder and add the frozen raspberries to your blondie batter! I like to break the frozen raspberries up with my fingers before folding them into the white bean blondie batter! That way, there will be less bleeding and fewer purple stains in your vegan blondies. Spread the vegan raspberry blondie batter evenly into your prepared brownie pan. Top the blondies with a couple more raspberries and some chocolate chips and bake them for 25 minutes or until the sides start to pull away from the pan and the surface of the vegan raspberry blondies starts to crack. Let them cool completely – preferably overnight in the fridge, then cut your vegan raspberry blondies into squares! Serve them chilled and top them with a dollop of coconut whipped cream for a showstopping vegan dessert for guests! Guys, I really hope you get to try these amazing Vegan Raspberry Blondies! 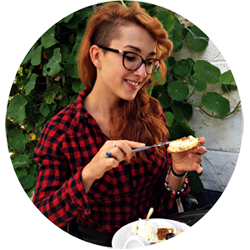 I mean, when else can you find a healthy vegan dessert that is sugar-free, gluten-free, clean eating-approved and low in calories? And on top of that, these healthy blondies taste just like your favourite white chocolate blondie! 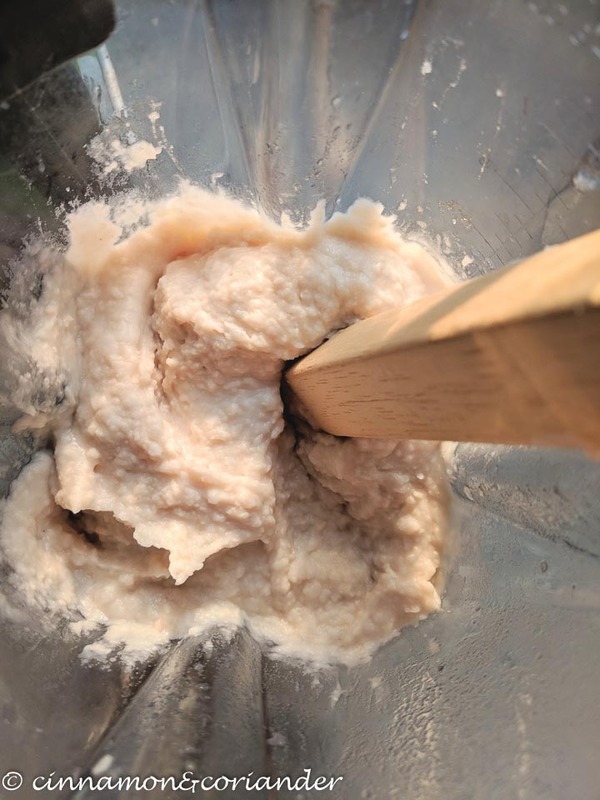 Make sure your white beans are drained very very well, otherwise your batter will be too liquid! 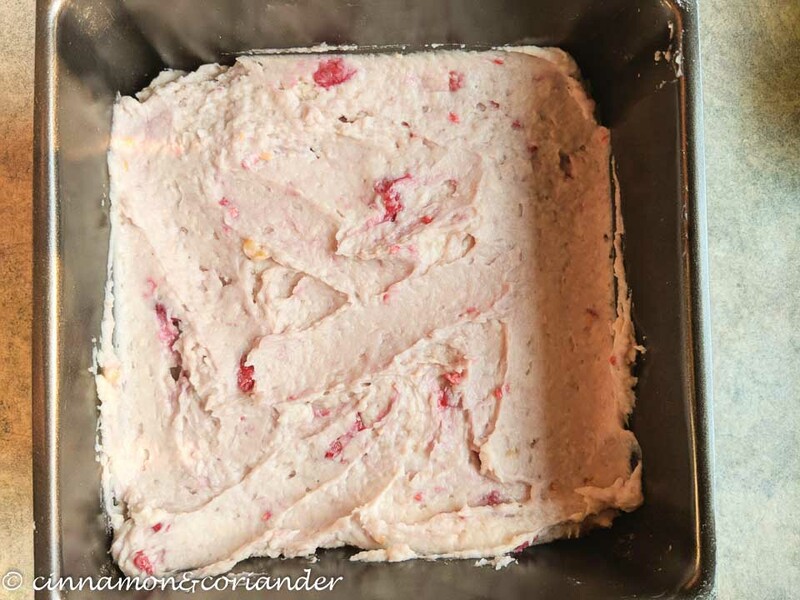 Use frozen raspberries and break them up with your fingers before mixing them into the vegan blondie batter. Do not add more than one cup of raspberries to the blondie batter. I usually even save some for the top! Swap the raspberries for red currants, blueberries or cherries and add some cinnamon and nutmeg to add more spice to this healthy vegan dessert. Serve these Vegan Raspberry Blondies with coconut whipped cream and drizzle them with some homemade limoncello. For more healthy vegan desserts, make sure to check out my White Bean Blondies with Peanut Butter, my Black Bean Brownies (OMG! ) and my Vegan Chocolate Mousse! These Vegan Raspberry Blondies are a decadent, yet healthy vegan dessert that tastes just like white chocolate blondie - without any of the calories and without added sugar! 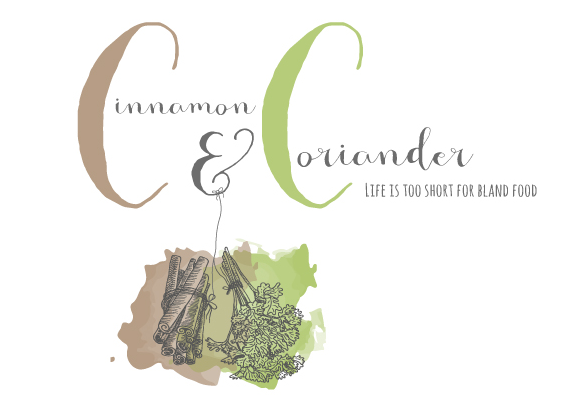 Easy to make with only a few ingredients! Line an 8-inch square brownie pan and preheat the oven to 350 F (175 C). Rinse and drain the beans very well, regardless of whether they come out of the can or are cooked from dried beans. Add all ingredients apart from baking powder and raspberries to a food processor and blend until smooth. Test the batter for sweetness. Stir in baking powder. Break frozen raspberries into small pieces with your fingers or by smashing the bottom of a pan on top of them. Fold them into the batter along with the chocolate chips. Bake the blondies for 25 to 30 minutes, until they start to pull away from the sides of the brownie pan. What a fabulous looking vegan raspberry blondies, guilt-free and delicious baked goodies bursting with fresh flavours. Thanks so much, Sherri! The white beans literally turn into fudge in this recipe! I mean, what’s not to love about raspberries and fudge right? I have never had a vegan brownie before but all the ingredients in the list sound like something I would enjoy. Love white beans but never paired them with fruit. I can’t wait to try this soon. I love raspberries but I also appreciate that these work with other red fruits like currants. Yum! 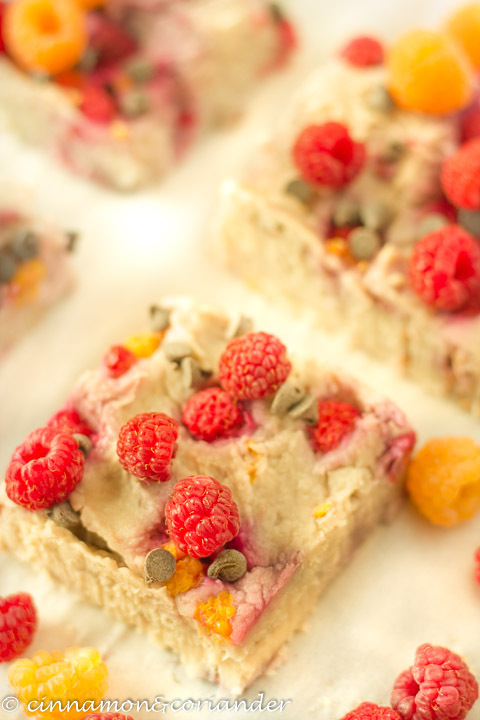 I’m a big fan of raspberries AND blondies so I am thrilled to see this recipe! Thanks for sharing. 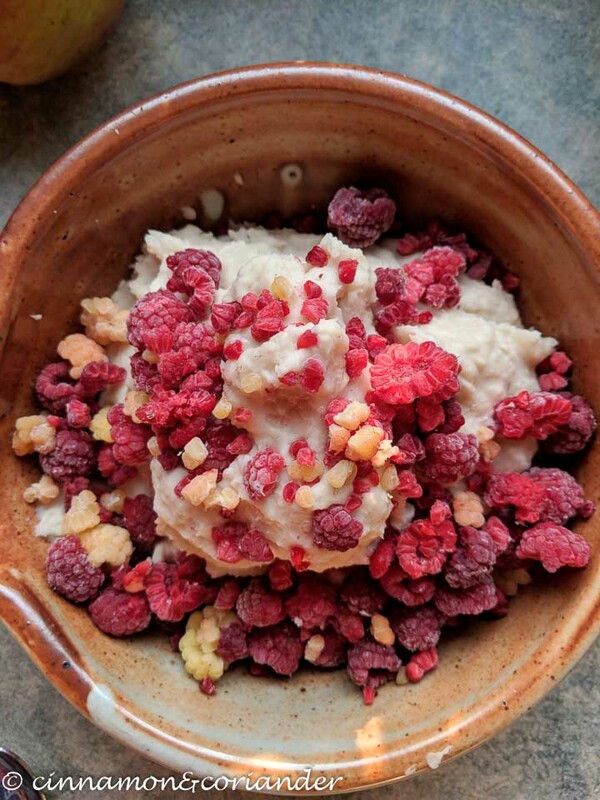 I am not a fan of either blondies and brownies (actually all the bars that I find here in Canada are a no no for me), but I love raspberries and am intrigued by the use of cannellini beans. We used them in pancakes following a recipe we found on a cookbook called ‘Spilling the beans’ which is awesome! Great job on these! These look absolutely delicious! Super intrigued by the use of white beans. My husband is gluten, dairy, and refined sugar-free, so I will definitely have to try these! These blondies look amazing! I love that they are made with beans. They sound so healthy but also very tasty. I love raspberry desserts!